Has Obama’s Past Been Decoded? co-founder Carl Gallups provides a narrative based on a recent article published at American Thinker which hypothesized as to the reasons the name “Soebarkah” appeared on documents released by the U.S. State Department in July 2010 said to be passport applications for Obama’s mother, Stanley Ann Dunham. Questions about the origins of Dunham’s alleged son, Barack Hussein Obama, have swirled since 2007, when commentator Chris Matthews stated on air that he was “born in Indonesia” and had an “Islamic background.” Since his first campaign for the presidency, Obama has claimed that he is a faithful Christian, although he attended a church which taught Black Liberation Theology in Chicago for many years led by the Rev. Jeremiah Wright. The U.S. Constitution mandates that the president and commander-in-chief must be a “natural born Citizen,” which most Americans understand to mean born in the United States. However, historically, the citizenship of the parents was a determining factor also, perhaps more important than the birthplace of the child. Children of foreign diplomats stationed in the U.S. are not granted U.S. citizenship, but rather, are born citizens of the nation of their parents’ citizenship. Since its passage, the meaning of the 14th Amendment has been misinterpreted to include as citizens anyone born within the borders of the United States, regardless of the “jurisdiction” to which the parents belong. In the video, Gallups points out that in early 2011, Loretta Fuddy was nominated and confirmed to the position of director of the Hawaii Department of Health after Dr. Neal Palafox’s nomination was unexpectedly derailed. Palafox himself had stated that he was removed from the nomination process unbeknownst to him until it was reported in the media. Fuddy had a background in social work and was the first non-medical doctor to head the department. She was nominated by newly-elected Gov. Neil Abercrombie, who has claimed that he knew Obama’s parents in Hawaii both before and after Obama was allegedly born there in August 1961. Abercrombie hadstated that “nobody was invited” to Obama’s parents’ alleged wedding on the island of Maui. Fuddy had been a central figure in the release of Obama’s purported long-form birth certificate after businessman Donald Trump questioned why Obama had never made it public amongst doubts that he is a “natural born Citizen” or even a U.S. citizen. After the Health Department announced a change in policy in 2009 to release only short-form birth certificates, Fuddy reportedly made an exception for Obama by permitting the copying of his original long-form birth certificate shortly before April 27, 2011, the day it was uploaded to the White House website. In 2001, Fuddy also was described by the Honolulu Advertiser as a “helper” in the Subud belief system and was shown experiencing the “latihan,” or “opening” first experienced by Bapak. However, the image was quickly declared a forgery by experts and later, by a two-plus-year criminal investigation carried out by the Maricopa County, AZ Cold Case Posse, which is ongoing, having branched out into other areas of Obama’s past for scrutiny. On December 11, 2013, Fuddy was declared deceased after the single-engine airplane in which she was traveling on official business was forced to make a water landing. The pilot, Clyde Kawasaki, whose skills were credited with making the expert landing after the plane’s engine failed, was reportedly shocked to hear that Fuddy had died, as when he last observed her, she was floating in the water along with the other survivors, all of whom had donned life vests under his supervision. An obituary for Fuddy states that her mother’s maiden name was “Antone” and that her birthday was April 12, although her brother’s apparent Facebook page shows a post appearing to have been made by Fuddy herself stating that it wasDecember 4. Reports of injuries resulting from the water landing differ between the National Transportation Safety Board (NTSB) and various AP articles. Fuddy was referred to as “Deliana” on the Subud website. Gallups responded to his son that Maricopa County Sheriff Joe Arpaio will shortly release “Arpaio brings out his devastating evidence in all of this.” Arpaio assumed a role in the investigation several months ago when Cold Case Posse lead investigator Mike Zullo stated that “universe-shattering evidence” had been uncovered regarding Obama’s background. Of Fuddy, Brandon said that she assumed the directorship of the Health Department “just three or four months” before Obama’s long-form birth certificate was publicly released. The president’s mother has served as any of a number of useful oversimplifications. In the capsule version of Obama’s life story, she is the white mother from Kansas coupled alliteratively to the black father from Kenya. She is corn-fed, white-bread, whatever Kenya is not. In “Dreams From My Father,” the memoir that helped power Obama’s political ascent, she is the shy, small-town girl who falls head over heels for the brilliant, charismatic African who steals the show. In the next chapter, she is the naïve idealist, the innocent abroad. In Obama’s presidential campaign, she was the struggling single mother, the food-stamp recipient, the victim of a health care system gone awry, pleading with her insurance company for cover­age as her life slipped away. And in the fevered imaginings of supermarket tabloids and the Internet, she is the atheist, the Marx­ist, the flower child, the mother who abandoned her son or duped the newspapers of Hawaii into printing a birth announcement for her Kenyan-born baby, on the off chance that he might want to be president someday. Dunham reportedly worked in “microfinance” in Indonesia for the Ford Foundation, which Peter Geithner, father of Obama’s former Treasury Secretary, Tim Geithner. This book covers Barack H. Obama, Jr’s rapid rise in American politics and the role that the CIA played in propelling him into the White House. Research is based on formerly classified CIA and State Department files, personal interviews, and international investigations. Obama’s birth certificate has never been the issue. The real issue, which affects his eligibility to serve as President of the United States, is his past and likely current Indonesian citizenship. The reader will be taken through the labyrinth of covert CIA operations in Africa, Southeast Asia, South Asia, and other regions. The real history of President Obama, his family, and the CIA quickly emerges as the reader wades into the murky waters of America’s covert foreign operations. Gallups reported that those joining the spiritual community of Subud often changed their names or adopted a new name. Fuddy reportedly was born in British Columbia, Canada. An entry from August last year states that family members still reside in Canada. Her last personal entry was made on December 10, 2013, the day before her death. An article in Midweek from August 2013 stated that Fuddy was raised with “Catholic values” and was “known to her friends as ‘Deliana.’” The same article quoted Fuddy as having described “health” as “the alignment of social, mental and spiritual well-being – body, mind, spirit – that allows citizens to be actively engaged in the community.” Her “faith” and “public service” were said to have been intertwined. 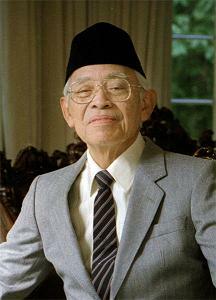 Bapak believed that his followers should be active in assisting less fortunate members of the community. 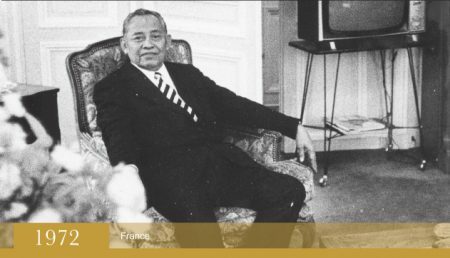 Sumohadiwidjojo was born in Indonesia in 1901 and in his early 30s claimed to have experienced a spiritual awakening of sorts which he sought to share with others seeking a deeper relationship with God. A practicing Muslim when he experienced his “receiving,” Sumohadiwidjojo eventually traveled worldwide to share his beliefs with others, including Christians, Hindus and Buddhists. Dunham reportedly lived in Indonesia for much of her life and was known bymultiple names. She is reported to have taught English at the U.S. Embassy, worked in the field of “rural development” and as “a consultant” to the Indonesian government while living in Indonesia. 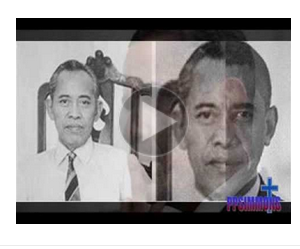 In August 2010, The Post & Email interviewed a native Indonesian who became a naturalized U.S. citizen regarding the name “Soebarkah.” At that time, our interviewee believed that the name indicated that Obama had been adopted by his Indonesian stepfather, Lolo Soetoro. “Sam” told us that it was common for Indonesian people to be known by only one name, a fact confirmed by Scott in her biography of Dunham. Dunham and her parents have been described as “Marxist atheists.” Bapak reportedly opposed communism. Department of Health is also celebrated.